Traveling Food Lady: Cookies, Anyone? You know, I just bought the Kisses, because visions of these cookies have been dancing through my head! I'm not much of a cookie baker, so it remains to be seen if I will bake the cookies, or eat the kisses first! t.w.~these are the best and everyone loves them`go ahead,give them a try! I don't have any sweet cookie memory from my childhood, as my mother never baked cookies, so I am creating adult cookie memories. Your get-together sounds like fun and your favorite cookies look adorable. yummy! my mom always makes spritz cookies with a cookie dough gun, my job was to decorate with sprinkles. We had a wonder-full time, Jann, and hope we continue the tradition yearly! I haven't dared get on the scales since, but have been motivated to walk daily to assuage my guilt! The tomato soup was the best ever and how can you make grilled cheese gourmet??? You always amaze me. These cookies with the kisses bring back such fond memories. 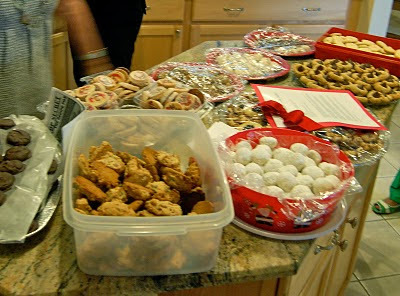 Your cookie exchange looks awesome. These are my favorite too! Today I'm in the kitchen and these are first on my list. Hope you have a blessed Christmas and Bonne Annee! Friends gathering together is always a special and nurturing time, no matter the reason. 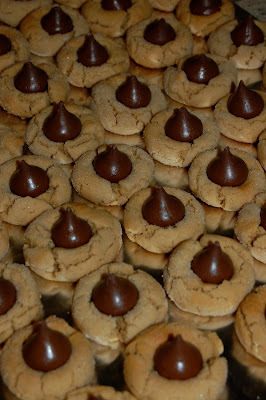 I love the festive look of those peanut butter kisses! PS - It's so nice to see you back, Jann. I've missed you.